Recently Erwin informed me, that a new comment had come in to one of his older posts: „Is there an easy way to draw the ‘man in the maze’ labyrinth?“ I was about to answer in the comment box, but it turned out that it was not that easy. However, there is a sure way, and this is not really difficult either. Two elements are needed for this purpose: An auxiliary figure and the seed pattern. Let us have a closer look at what this means, using the labyrinth presented by Erwin. As Erwin correctly notes, this is a labyrinth of the Cretan type. All the walls are arranged in a strict geometric order. They all lie on a special grid. 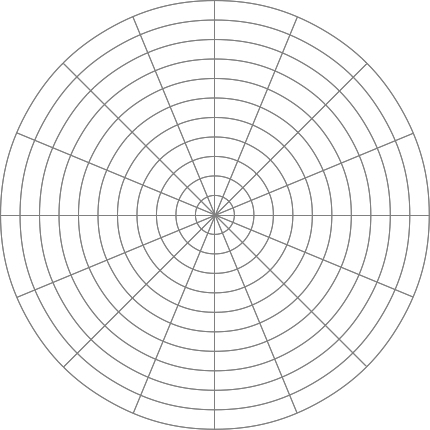 This is made-up of a wheel with 11 concentric circles / rings and 16 spokes. This grid is the auxiliary figure we need. 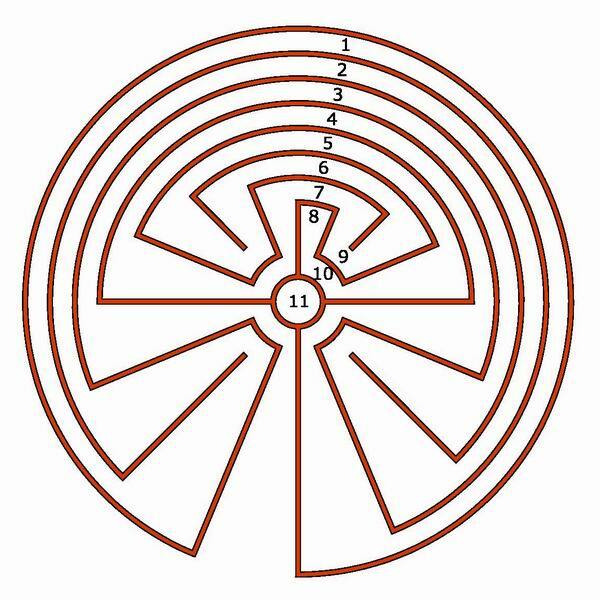 In his drawing, Erwin has numbered the circuits of the labyrinth from 1 through 10 with the (not accessible) middle being number 11. This same enumeration can also be applied to the walls. These lie on the rings of the grid. Then, the outermost ring has the number 1, the innermost ring number 11. The second element we need, is the seed pattern. As we want to draw the labyrinth represented by the walls, we also need the seed pattern for the walls of the labyrinth. And, since it is a labyrinth of the Cretan type, we need the seed pattern of the Cretan-type labyrinth. The seed pattern is first varied such that it fits to the auxiliary figure. 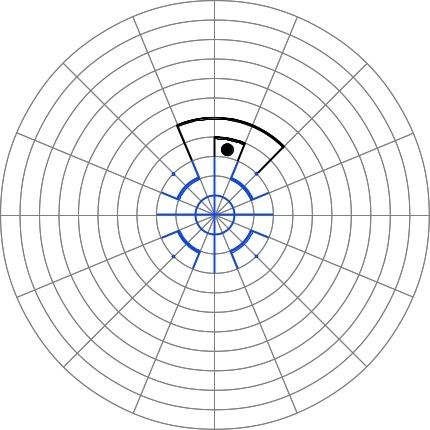 All the lines and dots must lie on the grid. Compared with some earlier variations, this is only a slight variation. It is immediately recognizable as a seed pattern of the Cretan type. This is now placed in the middle of the auxiliary figure. 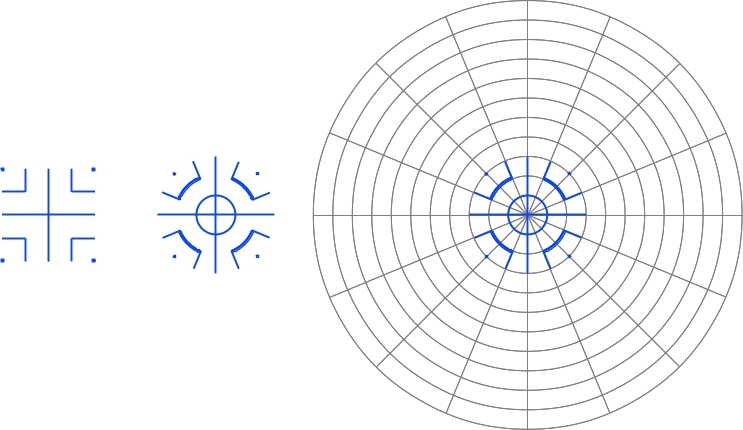 The 16 ends of the seed pattern are formed by the intersection points of the 16 spokes with the 9th ring. Now it remains to complete the seed pattern to the whole labyrinth. For this, first, the situation of the center of the labyrinth has to be determined. Then, we proceed exactly as described here. First, the two ends next to the center are connected. 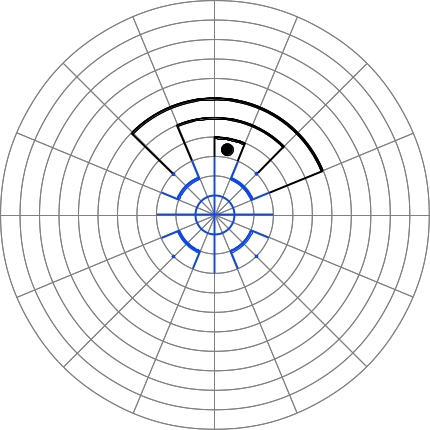 However, this is not done with an arc around the center, but using segments of lines that lie on the grid provided by the auxiliary figure. By this we draw the innermost wall of the labyrinth. We then continue with the ends next to first connection and create the second inner wall. Then follows the third connection in a similar way, and likewise all others follow. And by this, from the inside out, one wall is added after each other. Finally, one opening remains. This is the entrance to the labyrinth. If we then remove the auxiliary figure, we can easily view the final result. This guidance shows the importance of distinguishing between the type of a labyrinth and the layout. 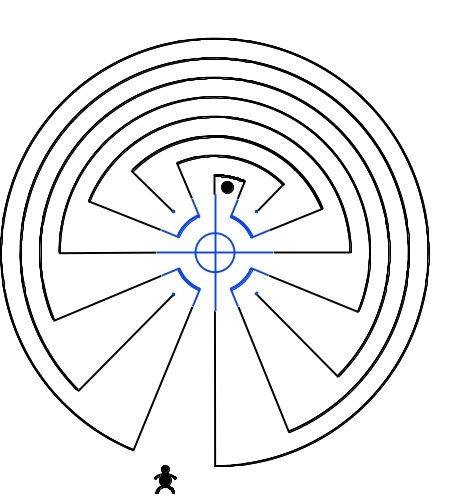 We have here drawn a Cretan-type labyrinth on a Man-in-the-Maze layout, or, let’s say: in the Man-in-the-Maze style (MiM-style). Every type of a one-arm labyrinth can be drawn in the MiM-style. The type of a labyrinth can be entirely represented by the seed pattern. This, actually, is the meaning and purpose of the seed pattern, that it contains the essence of the whole labyrinth. In my previous posts I have followed variations to the Cretan type labyrinth and examined their effects on the shape of the seed pattern. Some variants were found, that varied the seed pattern in such a way, that it was hardly recognizable and practically useless. Here I come back again to the original purpose of the seed pattern. In this case, where we want to draw a labyrinth in the MiM-style, the seed pattern is of essential practical use. Without it, I see no easy way. But using the seed pattern on the auxiliary figure, with some skills, it is even possible to draw a labyrinth freehand in the MiM-style. 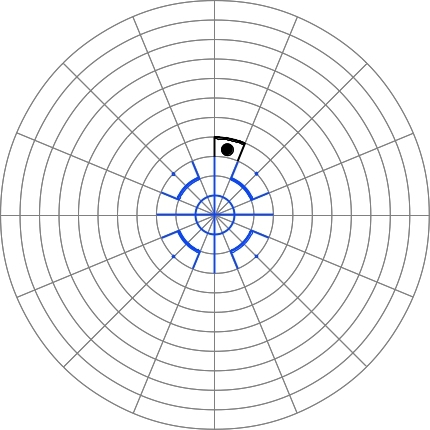 If I built this maze with about a 70′ diameter, how wide should the path be? how to I calculate the length of the ‘walls”? And what is a good material to use for the ‘walls’?. River rock seems ideal, but not readily available where I live. All walls lie on the rings or spokes of the auxiliary figure. This has 11 rings and 16 spokes. So I suggest you choose a size that is divisible by 11, e.g 66′ for the diameter. Then the auxiliary figure has rings with radii of 3, 6, and so on til 33′. The difference between two is the width of the path (incl. one wall) = 3. Length of the walls is calculated using the formula for the circumference of a circle = π*2r. Further keep in mind that the walls just cover parts of the rings. These can be expressed as fractions of n/16ths of the whole circumference. E.g. the outermost wall covers 15/16 of the ring. So its length calculates as 15/16*π*2*33=194. The wall next inside covers 13/16 and its length is 13/16*π*2*30 etc. Total length of walls on rings is 702. Now add the lengths of the pieces of walls on spokes. These all connect some rings. So their lengths are integral multiples of 3. E.g. 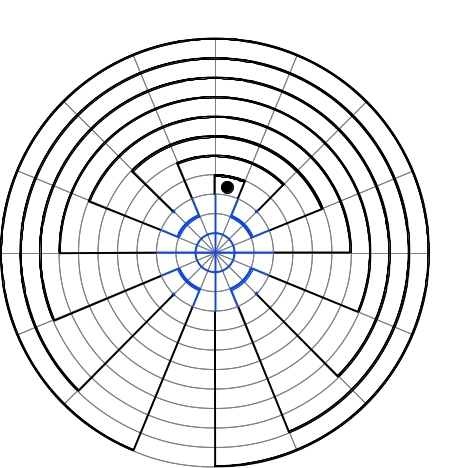 the length of the vertical piece of wall that connects the outermost ring with the seed pattern is 33 – 3 =30 (wall ending on the innermost circle as in fig. 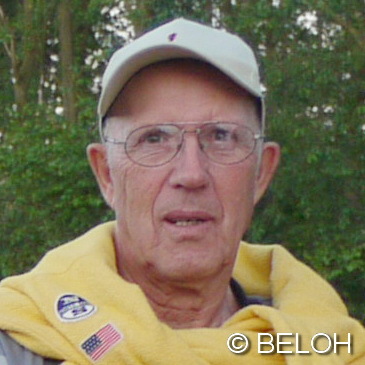 1 The Native Amercian Labyrinth). The length of the piece next left to it is 33 – 6 = 27. The lengths of all walls on spokes can be measured out similarly and sum up to 267. Total length of walls thus is 969. Thank you Andreas: What materials (besides river rock) would you suggest as esthetically pleasing and not prohibitively expensive. I don’t particularly like fireplace wood, although it would be inexpensive and not move around much. Using 18″ pieces, that would be 646 pieces – maybe a face cord or two of juniper/cedar. It would be a rough look. We often have cows crossing through the property and they are quite destructive. So need something substantial. I am not a builder of labyrinths, so I cannot give you advice based on practice. What seems important to me is that a labyrinth in this (Man-in-the-Maze) style asks for a certain clarity of the delineation. So the walls should have a clear shape. I doubt whether river rock or fireplace wood are suitable for this. Another question is: what is the base? Is it lawn, meadow, earth? If you think of using plants, I could imagine box tree for the walls. But this should contrast with the base. not notice this. You must contiinue your writing. Thank you Walter. I am using daedalus. On this blog, Andreas and I are trying to show the structure and “how to” make labyrinths in a simple and practical way.